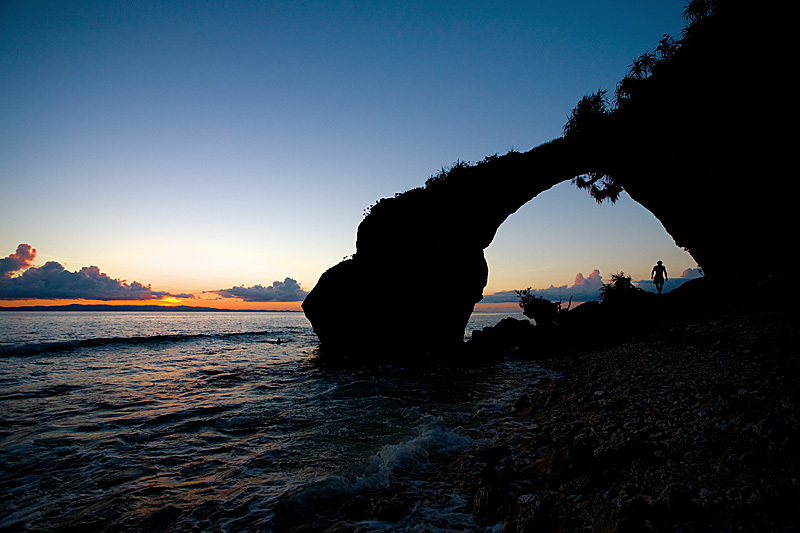 A Czech backpacker walks through a naturally formed arch at sunset. Still one of the few beautiful island chains in the world unmarred by rampant over-tourism, the Andaman islands offer perfect sunsets, crystal clear tropical waters and very few, if any, high-rise beach-side package tourist accommodations. Currently, the only methods to arrive in the Andaman islands are by relatively expensive flight or arduous 3-4 day boat journey. As a result of the transportation difficulty, lack of high-end accommodation choices, and the fact that a tourist must transit through India, the valiant few that make it to the islands are backpackers and other similarly hearty souls. Rumors constantly swirl of a direct flight between Bangkok to Port Blair, the capitol of the Andaman Islands. As far as I'm concerned, that will be the decisive death knell for yet another backpacker-discovered paradise turned upmarket carnival. Get there soon while it's still relatively pure and the primitive beach-side bungalows remain US$3/night. But be warned. Expect wildlife to share your hut. During my stay, I had a pair of roommates: one centipede and what I believed at the time to be a non-poisonous snake. Welcome once again to archived photos (on the weekends). This is the first weekend which doesn't exclusively feature Kashmir photos. We, however, didn't roam too far from Kashmir, jumping just to the far opposite side of India.